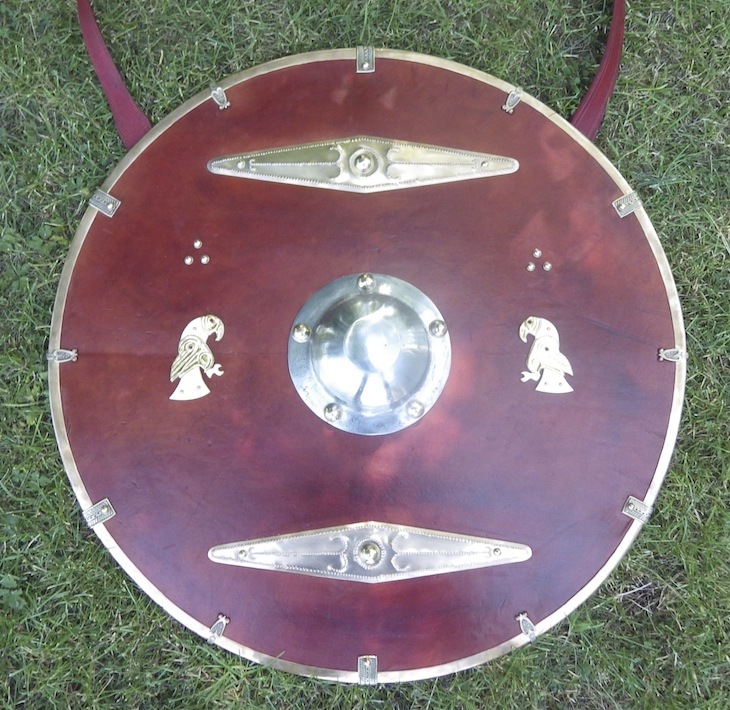 This is a Migration era shield based on elements from Sutton Hoo and a composite of other sources. 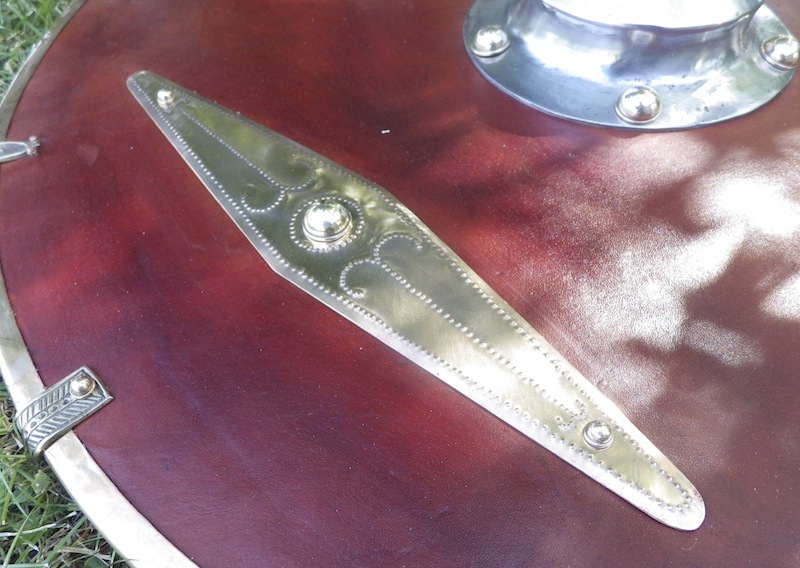 It is made from 10mm poplar, tapered to 6mm at the edge and the front face of veg tanned leather is bonded on; edging is bronze sheet with bronze clips and rivets as are the lozenges on the front face. The handle spar is mild steel and the handle grip is leather over ash. The boss is hand raised from 2mm mild. 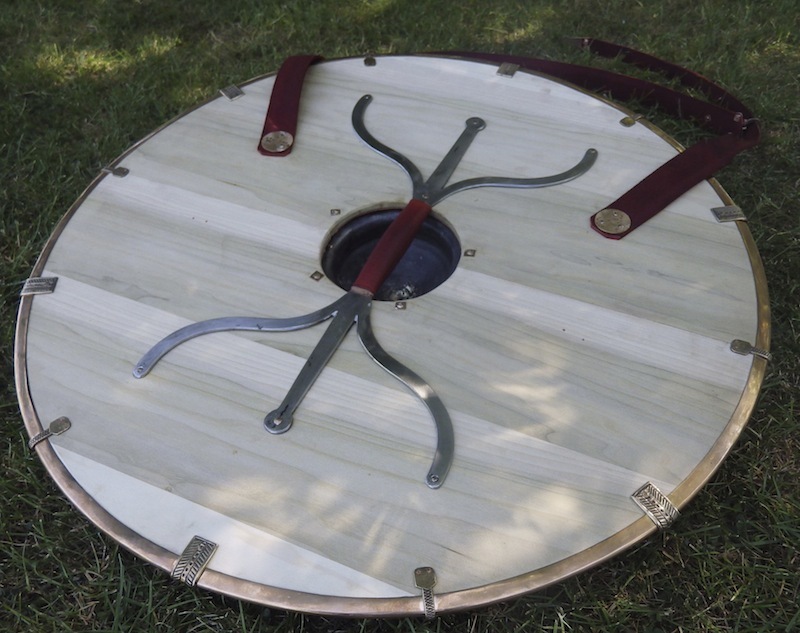 Overall the shield is 28" diameter and as yet I have not weighed it, but it is pretty light. 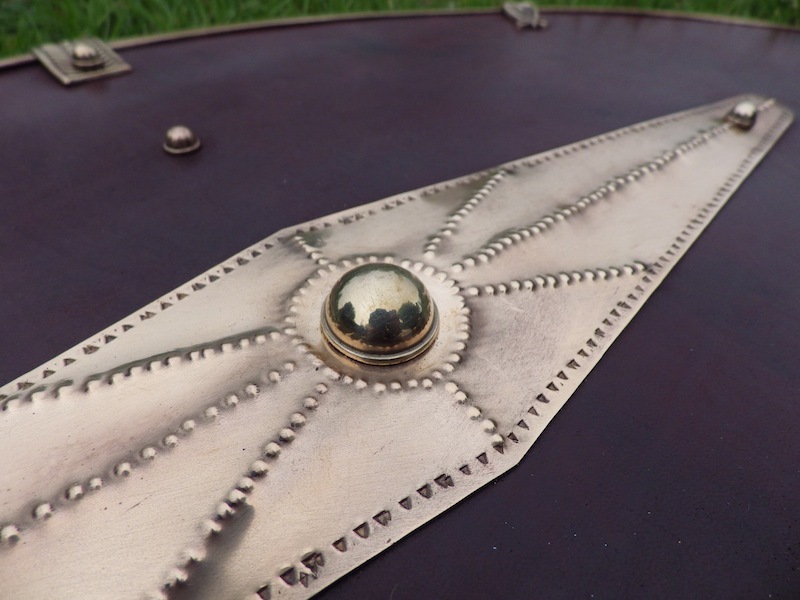 On a general note, there are very few finds of shields that are not associated with burials and there is speculation that the shields we do have are some sort of burial goods or votive offering and so were made thin as a result. 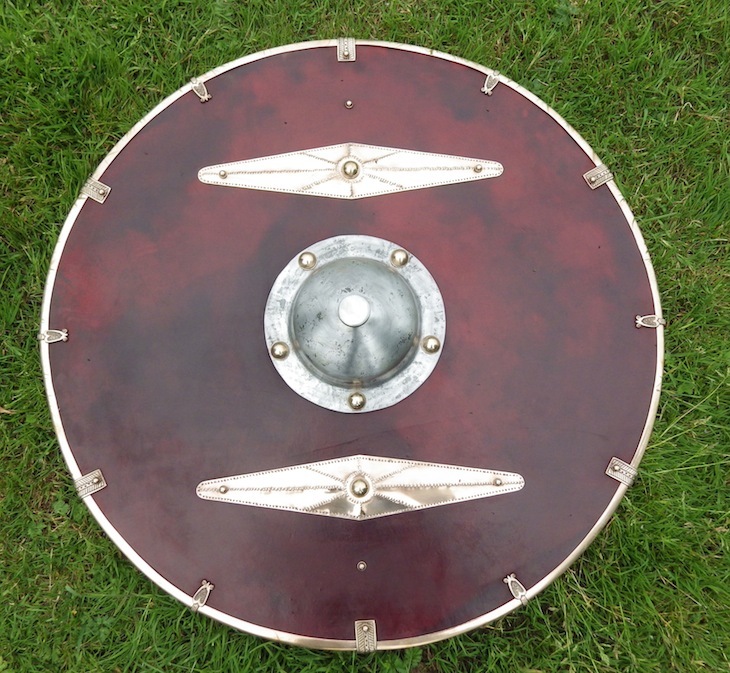 This shield is very thin (to modern minds) but is comparable to those finds that we do have. I don't actually want to smash this up to find out how tough it is, but my observations are that when the board is glued, but un-assembled it seems incredibly flimsy. When the rim is fitted it starts to feel tougher and with the spar on, it now seems much tougher, but really still very light. Really like it. Very well done. Like all the bronze. Might consider offering the clips on your foundry site. Did you do anything to enhance the (very nice) pattern on the leather? Dumb question... the boss tip is historical? Is there a function? As decoration seems a bit plain compared to the rest. This was a surprise & thank you for sharing. Yes Carl, these bosses look odd but are historically accurate for the age. 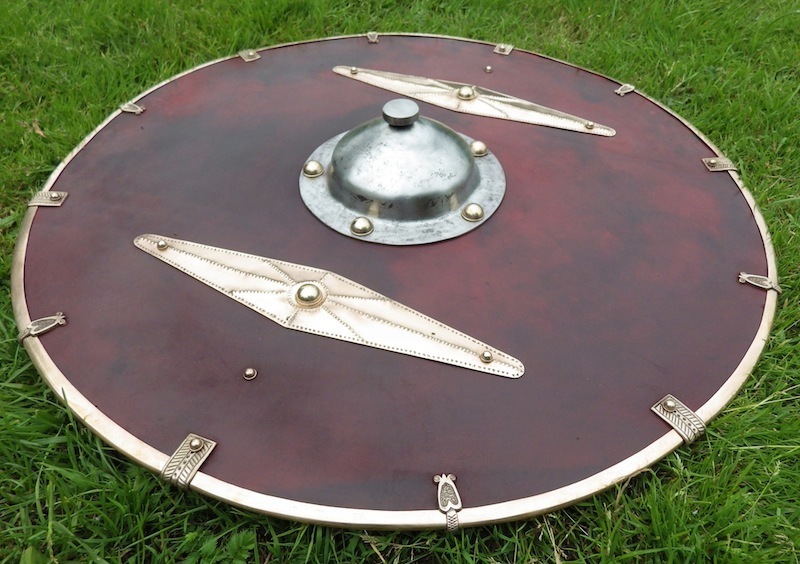 Nobody today knows for sure how they were used but logically you could hook shield edges with them, possibly you could lock a sword blade against the boss for a quick disarm (I've seen reenactors demonstrate this) and punch with added depth with the extended center. Other variants had the "plausible hooking" rim further in at the base of the buckler and a cone shaped center. Eventually along the timeline these shapes disappeared. Maybe they found out you could also get your own shield manipulated by the opponent if you had one, who knows. Maybe they were only suited for single combat and not a shield wall? 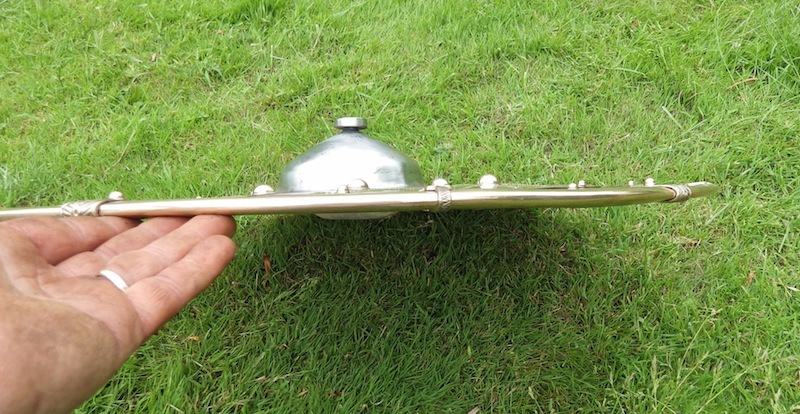 Similar extrusions can also be seen on the parabolic dish-looking bucklers of Henry VIII:s bodyguard (16th century, a thousand years later) and the renessance saw the spawning of a multitude of odd-looking bucklers and parrying devices with blade catchers and hooking devices on them. Even built-in extenable blades, pistols and lanterns. not my period of interest, but it really looks amazing. great piece of craftsmanship. how heavy is it? The leather was dyed to create a mottled effect, just by wetting the leather prior to dyeing to varying amounts. I am sure they will get onto the site eventually, but mail me in the meantime if you would like a set. The customer received it on Friday and was delighted, but before I could weigh it. However, we both estimated it at 2-3Kg. 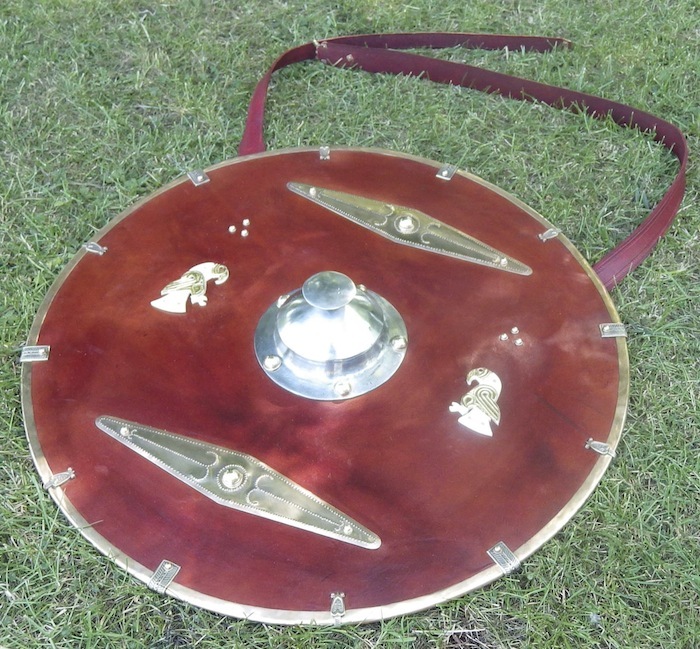 That is a very good looking shield! So the leather is not glued on? I usually use glue when facing my shields, resulting in a lot of trouble with the boards bending as it dries. Is the leather sewn on around the edge and held in place with the fittings and boss? The boss is hand raised from 2mm mild. Including the button, or is that an addition? Thanks guys; I really appreciate it. The leather was bonded on and was kept clamped flat as it dried and that minimises the warpage and what is left is taken out when the rim goes on. I have sparred with sharps using similar thin or dare i say it 'flimsy' shields. I'm pretty convinced that they are effective and representative of the style that can easily be used, and for long periods of time. You have to be nimble, and adept at reading whats coming at you plus using the face far more than the edge (where the button also comes into play a lot more of course) but a pretty handy tool. 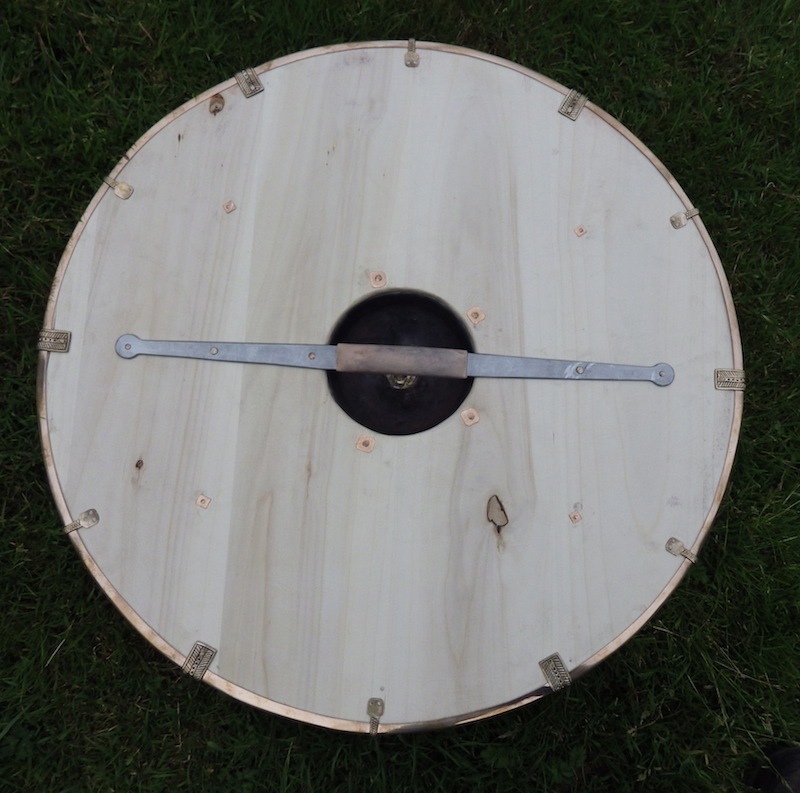 I have made a second shield with similar stats. The boards are 10mm poplar, tapered to around 6mm at the edge. The front hide is bonded on and the rear has been left with no covering to allow the planking to be seen. The boss was hand raised (by others) in steel. 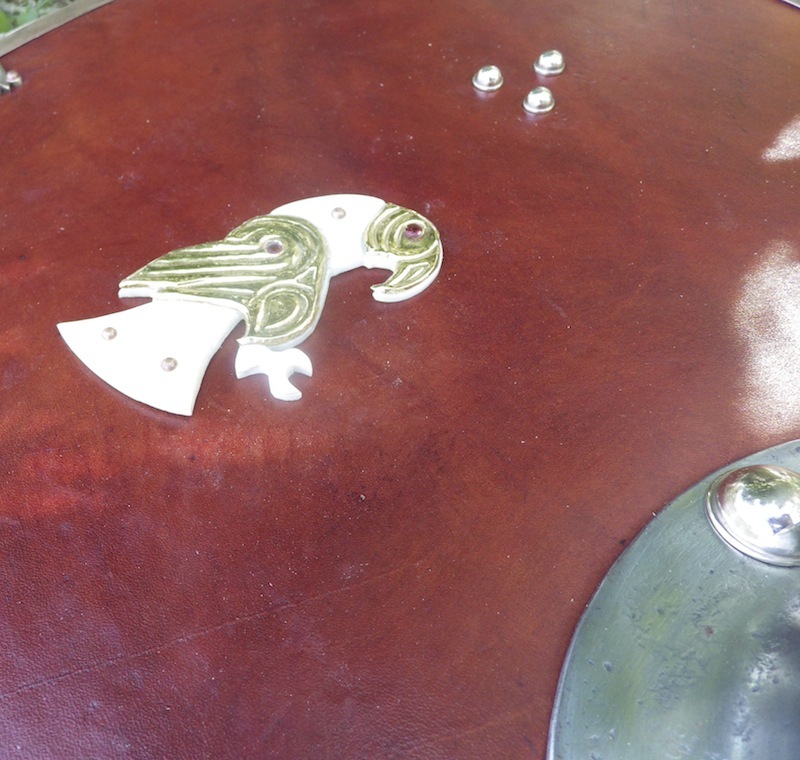 All the fittings except the ravens, are in bronze and riveted on with Bronze. 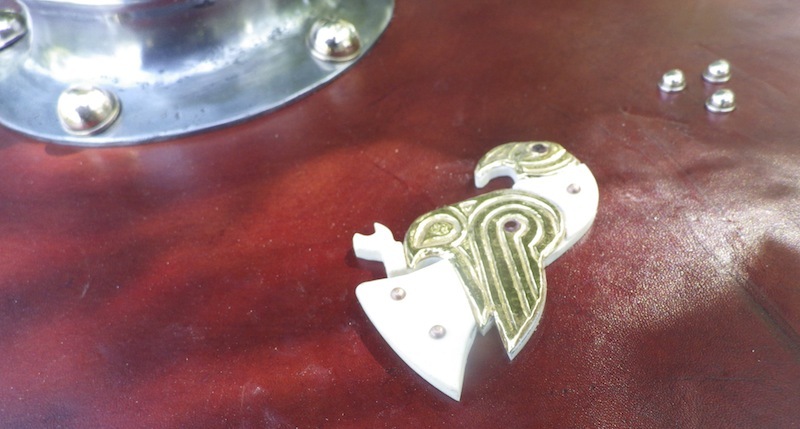 The ravens are copied from an original pair belonging to the shield owner and are bone with gold plated copper repousse elements and garnet eyes. The grip support on the rear is in steel with a wood and leather cord bound grip. I handed this over before I could get a weight, but I will ask if the new owner can weigh it. Beautiful shield. Love the design work. Great work! I wish I didn't live so far away as I would love one of these. Really, really beautiful piece. Leather face on shields are rare to see, and go extremely well with the bronze bits. Btw, Is the combined bone-bronze bird ornaments conjectural or documented? There are these kind of bird ornaments in copper alloy only from Valsgarde, right? Either way they are gorgeous! There are these kind of bird ornaments in copper alloy only from Valsgarde, right? Either way they are gorgeous! You do find examples in both English and Scandinavian finds where part of the copper alloy bird is gilded or tinned to give a contrasting colour effect. Fantastic job on the shield, Tod. That is excellent. Congratulations to the new owner. The Ravens are copied from an original pair that are owned by the man who commissioned this shied. I wil try to get a weight for it and post it up, as and when .